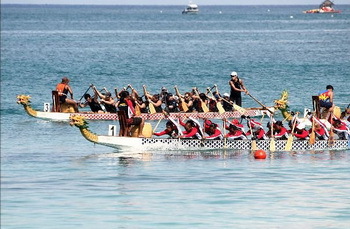 Dragon boat racing first began in Boracay in 2001. Since then, annual competitions have been held in the blue waters off White Beach. The Boracay Island Paddlers Association (BIPA) was given the mission of advocating Boracay as a sports destination with dragon boat racing as its main sport in year 2004. BIPA organized the first Boracay International Dragon Boat Festival in 2007 and since then these races have become an annual event in the island. Through the years, the event has gained much popularity and has now become one of the biggest international annual sporting events in the Philippines bringing together people from various parts of the world. In 2010, BIPA is proud to announce the 4th Boracay International Dragon Boat Festival to be held on April 22 to 24, 2010. This distinctive event will be held at the beachfront of the Boracay Regency Beach Resort and Convention Center. Surely this will be another time where dragon boat fanatics will flock and enjoy a fun-filled event incorporating the dragon boat spirit of sportsmanship and great international camaraderie. The Festival is supported by the Philippine Department of Tourism and the Municipality of Malay and officiated by the Philippine Dragon Boat Federation. This entry was posted on 星期二, 二月 7th, 2017	at 7:03 下午	and is filed under 最近	. You can follow any responses to this entry through the RSS 2.0	feed. You can skip to the end and leave a response. Pinging is currently not allowed.